Please note: END OF DECEMBER, FEBRUARY and MARCH, the boat rental is mandatory at an additional cost! Also Sat to Sat rentals only from December - April. Look forward to welcoming you!! Envision this...waking up to the sounds of exotic birds singing in the beautiful morning sunshine! You grab your cup of coffee and head down to your dock. While you are enjoying the serenity, you catch a glimpse of the manatee slowly sauntering past, or the dolphins jumping! This is the perfect vacation rental home for your Florida journey. This ranch style home has all the comforts of your home. 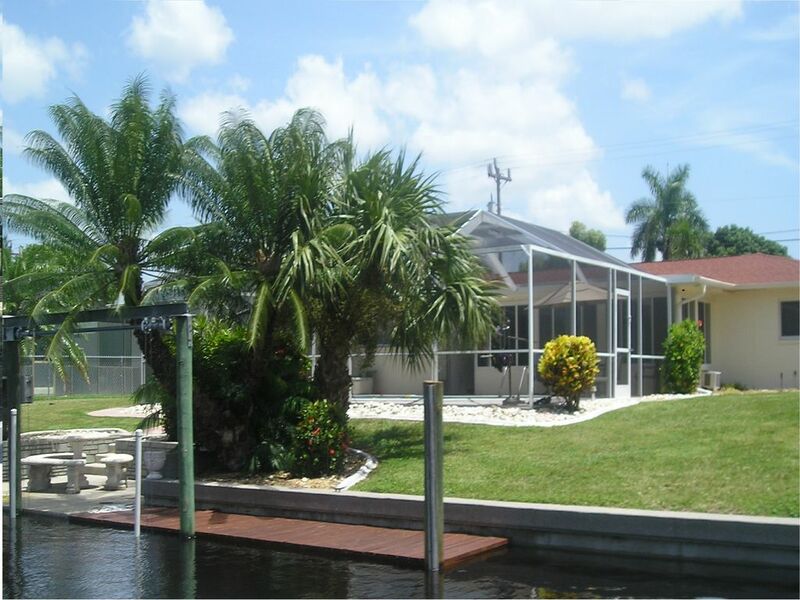 Enjoy the comfortable, vacation living in our beautiful pool home located in the yacht club area of Cape Coral, on a canal, just MINUTES away from the open waters of the Gulf of Mexico. This home features a large family room with a large screen TV, a bright and attractively furnished enclosed lanai, 3 spacious bedrooms and 2 bathrooms. The large master suite which opens to the lanai, features a cozy pillow-topped King size bed, an ensuite with a large walk-in tiled shower and a huge walk-in closet. Also, there are two further bedrooms, one featuring a Queen size bed and the third bedroom outfitted with 2 twin beds. No need to bring linens or go to the Laundromat...we have everything you need, just like home! The fully equipped kitchen, which has a pass through to the lanai, comes with new appliances, ice maker, and dishwasher! Everything you need - that's if you so wish to cook! The pool area - with south western exposure - is fully screened, has a comfortable patio set, loungers and a large BBQ grill for everyone's enjoyment. The new heated pool features ceramic dolphins swimming and fibre optic lighting; choose your colour in the evening to set the mood! The pool overlooks the canal and the additional patio with boat dock; you can salt water fish off your own dock! This beautiful, waterfront home has direct access and is minutes away from the open waters of the Gulf of Mexico. We have a 24' motor boat available to those boating enthusiasts at an additional nominal weekly charge. Boat rental is mandatory during peak season (Dec - Apr). This home is a 15 minute walk to the beach, shops and restaurants. Wonderful Golf courses are nearby! This is your home-away-from-home, so let the relaxation and fun begin! Once you have experienced a vacation in this home, we are sure it will be your favourite vacation spot for years to come. Call us for last minute deals! My family and I just love the ocean, the sea life and the fantastic weather that Florida offers. I don't think we will ever get tired or stop screaming in excitement when we have a dolphin or two swimming beside our boat! We love Cape Coral, the yacht club in particular because it is close to everything we need and the people are fantastic; we have made many friends. We decided to purchase our vacation rental home in the yacht club area because of the proximity to the open waters...within minutes we are in prime boating, fishing and shelling areas. situated on a beautiful canal, just minutes from the open waters. Our new pool is heated! Great home, location, pool and owners! This rental is comfortable and the location was perfect for us with easy access to boating sites, friends & family in the area as well as recreational and dining sites. It was nice having a boat but, with all the other activities we had, we didn't really use it enough to justify the expense. Brad and Nadia were great hosts and we loved floating in the pool at the end of the day. This place is dark, dingy, and dirty. We planned on staying for two weeks and left after 3 days. We ended up paying for another rental down the street which was clean, and up to date. We received no refund and we did not get all our deposit back. Total nightmare. The afternoon you arrived, you sent an email stating how lovely everything was and you were so happy. Even the next afternoon when I came down to provide the boat orientation, both you and your brother kept telling me how lovely the house is and the area and thank me multiple times. I am sorry that you had friends arrive last minute that we could not accommodate, 9 people is more than the home can accommodate unfortunately. You told me everything was okay, that you understood and that they would have to look elsewhere. Then on the 4th day, I receive an email from you stating that you 'left the home and will not be back'. I kept emailing you, making sure that everything was ok and you finally responded 2 days later. We do not provide refunds just because you had friends arrive and would of rather stayed with them. You received your security deposit less the fees you agreed too (dog fee and credit card fee) back as required. It is a shame that you are angry with us because we would not allow a house full of people with no beds to sleep in. We try to accommodate as best as we can. We had a great vacation in this lovely home. Great welcome booklet with good information when you arrive. The home is very clean, nicely decorated and very comfortable. Good distance to the beach, we would ride the bikes or walk almost every day. The pool is a great size and enough lounge chairs on the deck. Highly recommend this home for your vacation is Cape Coral. Good location and great owners that will make sure your stay is pleasant. Thanks so much for letting us use your lovely home. It was so great to have you and your family stay in our home. We are glad you enjoyed yourselves and thanks for letting us know that you enjoy the welcome booklet (that's a new touch) :) We would love to have you all back anytime. Thanks again. Well equipped and comfortable home with easy access to open water on the rented pontoon. Short drive to beach,restaurants, and a farmers market on Saturday for fresh fruit and vegetables. Jim it was so great having you and thank you for the review! We would love to have you back anytime. Thanks again very much! We enjoyed a wonderful week. Brad and Nadia are very friendly and are very accommodating with every request. We rented the boat, which I think is a must for this location. The house is cozy and enjoyable. The little extras are provided, including plenty of bath towels, pool towels, kitchen glassware, silverware and cookware. Very nice to have a full size washer and dryer. Also, it was great to be able to bring our older dogs with us. We would return to this rental. Swim in your own heated pool or enjoy the beach just around the corner. Olympic size pool, tennis and racquetball available at the yacht Club, golf courses all around. Shop in downtown Cape Coral or at the malls in Ft. Myers. Restaurants for every taste...Sanibel and Captiva with their famous shelling beaches are 20 minutes away by car or boat! If you so wish, there is plenty to do on your vacation! STILL HAVE QUESTIONS?? Contact us at 239-233-7224 or by email at nadiawilliams0@gmail.com BOAT RENTALS ARE MANDATORY DURING PEAK SEASON (Holidays, February , March) at a cost of $1000.00 per week. Additional fee - cleaning & electrical. Rental price may be slightly higher for holiday periods. Pay through the VRBO or PayPal if more comfortable with this, but please note that they do charge a small fee. Of course you can pay by personal check or money order and there is NO FEE to you! !